Every Rough-Hewn production that I’ve seen has opened by throwing you straight into the drama. Rather than face the stage curtain upon entering the theatre, at least one of the actors is present on stage. The intimacy of the Pilch studio particularly lends itself to this style of presentation, the erosion of the performance/audience barrier suiting Rough-Hewn’s stated aim to present ‘visceral’ and ‘inescapable’ performances. The sensation that you have in some way intruded, as an audience member, upon a private moment or even another world is particularly appropriate for the latest production in their Wasted Earth season, Shells, by Howard Coase. A disorienting kaleidoscope of scenes and suggestions, the close of the play leaves you still trying to piece together the missing elements. Lewis (James Kitchin) sits, shaking, in an armchair surrounded by sand. The world is slowly being submerged and he and his companion, Ben (Harley Viveash), are trying to survive. They are in the employ of an elusive character who, as we eventually learn with the arrival of Helen, needs them to look after the rare and precious remaining fertile women. 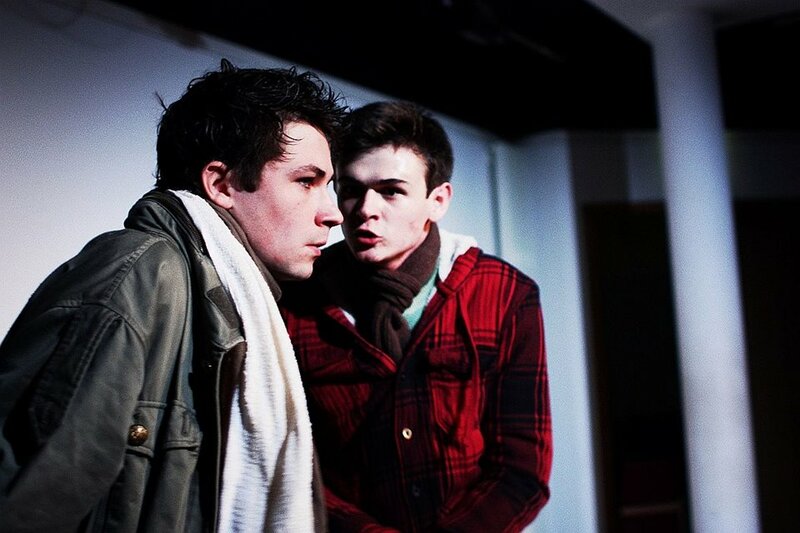 Lewis and Ben’s opening scene was brilliantly executed, bringing out the sharp and darkly comic humour of the script as the two characters play off each other’s weaknesses. Kitchin’s performance as Lewis was spectacular, his final descent into madness thoroughly believable in the context of his neurotic fragility throughout the play. While he was equally matched by Viveash, unfortunately Rebecca Banatvala as Helen and Anirudh Mathur as Adam did not seem to have the same fluidity and seemed a little uncomfortable in their characters. While there were moments of tenderness in their brief scene, Mathur lacked the menace of someone supposedly in control of so many lives. This is perhaps in part due to the script; the manner in which Adam is referred to by Lewis and Ben suggests an absent puppet-master, that they are being manipulated by a higher power whose reality (and motives) the audience is left in doubt of. Therefore his appearance as a remarkably present and human force seemed a little incongruous, despite the fact that the play is focused upon humanity’s potential for manipulation and complete lack of compassion. The dystopian landscape envisioned by Coase was effectively evoked by the sparse set and lighting design. The script was particularly thought-provoking, raising many uncomfortable questions: does it take destruction for humans to recognise beauty in nature? can we sustain our current way of living without destroying our environment? how does humanity change its values when threatened? at what point does love become a destructive obsession? However, the gaps left in providing the context for these questions left the dramatic climax a little undermined. Whilst the dialogue throughout was sharp, witty, and unsettling, the picture of this dystopia gained by the end of the play, and thus the full impact of its consequences, was a little too incomplete to be as fully convincing as the previous installment of the Wasted Earth season, Foxfinder. At only 90 minutes long, Shells could perhaps have benefitted from an extra 30 minutes of writing to give some weight to the numerous themes that it attempted to address. With echoes of The Handmaid’s Tale by Margaret Atwood, Shells is an intriguing addition to a vast repertoire of dystopian plays; the writing remains compelling despite the numerous ambiguities and strands left floating at the close. With some truly fantastic performances and artistic direction, this production will certainly leave you asking: what would you do if there was not enough earth for the people on it? Shells runs for two more performances at the Pilch Studio at 14:30 and 19:30; tickets can be obtained here. For more information about Rough-Hewn, please visit their website.